Each autumn, thousands of Central New York families take the scenic drive on Route 20 to LaFayette. Their destination? 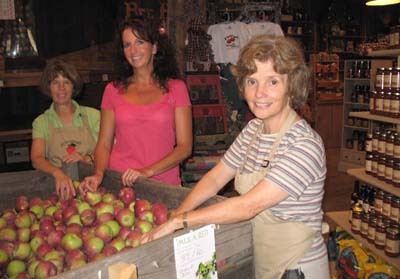 Beak and Skiff Apple Farms, one of the area’s most enduring family-owned businesses. The Beak and Skiff families started their wholesale apple business in 1911. These days, Beak and Skiff’s endeavors include a thriving farm market and a winery/cidery. A distillery will open soon. But the pick-your-own orchard is what brings people to the farm, and chances are a fourth- or fifth-generation family member is on the premises. Sisters Candy Beak Morse and Charlene Beak Stack and their cousin Jackie Beak have spent much of their adult lives on the farm. They’ve endured years of hard, physical work, the chronic unpredictability of the Central New York growing season, and economic hardships. Yet each says she wouldn’t want to be anywhere else from late August until Thanksgiving. “We were brought up working on the farm every fall. We didn’t really know anything different,” says Morse. Jackie Beak and her brother Tim grew up on the farm and Jackie still lives on the property. Like her cousins, she has filled various roles on the farm as its needs changed. Today, she supervises the packing of apples for wholesale—which the Beaks and Skiffs have done since 1911. Aside from a brief stint working road construction, Beak says the rhythms of life on the farm have always agreed with her. She credits that to the years she spent as a child working alongside her father, Richard Beak. Unlike Beak, Tully resident Morse didn’t always envision the family business as her calling. But the strong work ethic she and Stack learned from their father couldn’t be denied. Upbeat and personable, Morse seems to have found a comfortable niche as retail manager of the Beak and Skiff operation and is often found in the country store. The store has evolved since it first opened in 1976. Once just a small shack, the store now occupies an old cow barn—a reminder of the Beak family’s initial commitment to dairy farming. The country store opens when the pick-your-own season begins in late August and remains open after the last of the apples are harvested in October. The season culminates with a family party on the day before Thanksgiving. Stack, who lives in Navarino, says although the public aspect of the business ends with the harvest, packing and distribution continue all year. Then there is planning for the next crop. Many local school groups have enjoyed trips to the farm over the years, and the families like being able to share it with young people. Morse remembers her father taking school groups around himself. These days, the visits are limited to preschools and special education groups. “We really had to cut back because we want the experience to be as enjoyable as possible—for the children who come to visit, and for the other people who are visiting the pick-your-own orchard,” she says. Family members are not handed jobs on the farm, Morse says. Youngsters have to come to the owners and ask. Several members of the Beaks’ and Skiffs’ fifth generations, including Morse’s daughter, Cait, help out on a seasonal basis or as often as their non-apple-related pursuits permit. For all of its history, the Beak and Skiff business always has an eye on the future. The Web has increased national demand for apples, and sales from the winery and cidery have shown steady growth. The distillery is slated to open any time. Nonetheless, apple lovers will have 15 varieties of apples to choose from this year. Beak says this is fewer than in the past as a result of customer demand. Empire is now Beak and Skiff’s most popular apple, with Northern Spy and McIntosh not far behind.